The fin whale is the world's second largest animal behind the blue whale. It reaches 24 m in length and weighs up to 80 tons. Its body has a long, slender, streamlined appearance, with a pointed, V-shaped head. Its back ranges from dark grey to brown-black, it has a white belly, the back of its head is marked by light grey chevrons, and the front has asymmetrical white markings — the lower right lip is white, and the lower left lip is dark. Its dorsal fin is relatively small, sickle-shaped, and set back on its body. The fin whale is a rorqual baleen whale, and so its throat is marked by 50-100 long grooves that allow for throat expansion. The fin whale's blow is narrow and cone-shaped; shortly after a blow, its strongly curved dorsal fin appears. Its tail fluke edge is distinctly notched in the centre and only slightly concave. Its tail shape is not a major identifying feature, however, as it rarely lifts its tail fluke above the surface when initiating a dive. The fin whale usually appears singly or in small groups of 2-7. More than 100 may group together at feeding grounds. Fin whales inhabit deep offshore water in oceans throughout the world, though they are more common in temperate than tropical or ice-covered polar waters. There are two subspecies which don't appear to interact - the northern subspecies, Balaeoptera physalus physalus; and the southern, or Antarctic subspecies, B. p. quoyi. Both subspecies spend the winter months at lower latitudes, and migrate poleward to feed in the summer. 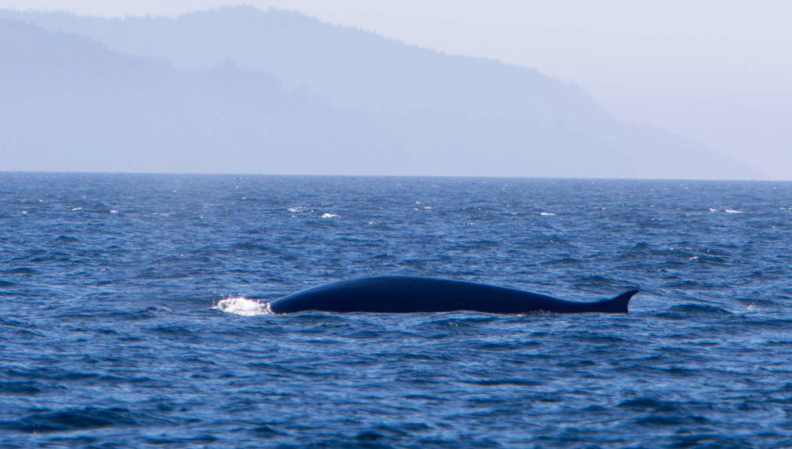 Fin whales are infrequently seen in coastal British Columbia waters. Historically they were frequently spotted or hunted in exposed coastal waters along BC, including Queen Charlotte Sound and Hecate Strait, Dixon Entrance, and offshore northern Vancouver Island, as well as occasionally in more sheltered areas such as Queen Charlotte Strait and the Strait of Georgia. Recently they have been most commonly sighted in Queen Charlotte Sound, Hecate Strait, and Dixon Entrance, as well as off southern Vancouver Island. The blue whale and the sei whale are similarly-sized rorquals. The fin whale has a darker colouring than the blue whale, and where the former has a distinct dorsal fin that is seen shortly after the blow, the latter has a much smaller dorsal fin that appears long after the blow. The distinct asymmetrical jaw colouring of the fin whales distinguishes it from the sei whale. Fin whales were historically hunted off the coast of British Columbia. Between 1905 and 1967 over 7600 fin whales were harvested in coastal waters, and thousands more were harvested in pelagic waters in the 1970's. Fin whales are the fastest cetaceans in the world: they can reach speeds of 37 kilometres per hour, and are often dubbed the "greyhound of the ocean." They can also almost completely leave the water when breaching. Conservation: the fin whale is a red-listed species in BC, and the Pacific population is listed as threatened. The Pacific population was severely depleted by whaling in the early 1900's, and is thought to currently be at less than 50% of historic levels. Current threats to this population and its recovery include ship strikes, of which fin whales are a major victim; entanglement in fishing gear, particularly gillnets; and illegal harvesting. Contaminants and noise pollution may also impact this species. physalus in Canada. Committee on the Status of Endangered Wildlife in Canada. Ottawa. Harbo, R. M. (1999). Whelks to whales: Coastal marine life of the Pacific Northwest. Madeira Park, BC: Harbour Publishing. P. 198. Fin whale (Balaenoptera physalus). ARKive.org. Accessed 21/01/2014. FIN WHALE (Balaenoptera physalus). Wild Whales B.C. Cetacean Sightings Network. Vancouver Aquarium. Accessed 21/01/2014. Shore, V. Balaenoptera physalus (Linnaeus, 1758). In Klinkenberg, Brian. (Ed.). E-Fauna BC: Electronic Atlas of the Fauna of British Columbia. Lab for Advanced Spatial Analysis, Department of Geography, University of British Columbia, Vancouver. Accessed 21/01/2014.